Just last week, the My|Phone T13 Duo dual sim phone that I have been using for almost 2 years, suddenly went broke after an inexplicable little sound “tok!” was heard while charging it up and was now officially dead (RIP). I have been using it as back-up unit for my Sun and Smart sim cards mainly for receiving calls and SMS for both personal and business use. I was left with no choice but to use my main phone for my 3 sim cards (Globe, Sun and Smart). But interchanging the 3 sim cards on my main phone is quite troublesome and very time consuming so I decided just to buy new dual sim phone that is not too expensive since I'll be using it just for calls and SMS for my 2 back-up sim cards. My first option was to buy My|Phone B11 Duo that I have blogged earlier, but as I checked their website, it is no longer offered there. So I checked out Cherry Mobile for their phones and good thing they are currently on sale this December! 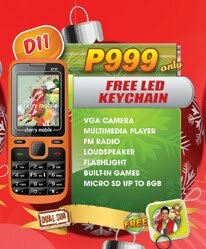 What caught my attention was the Cherry Mobile D11, a dual sim phone, with VGA camera, multimedia player, flashlight, bluetooth, micro SD slot up to 8GB, LoudSpeaker and 3.5mm headset jack for only P999! With such features, I must say that it is really a great deal (well, for now). I have already bought 1 unit, black and red in color and so far, so good. But I'm still on testing mode. So watch out for my review on Cherry Mobile D11 that hopefully will be posted next week. ARE THERE ANY DOWNLOADABLE THEMES 4 THIS ONE..? bakit hindi magkasya ang memory card ng nokia c3 dto sa D11? hindi ba sila compatible? ano pwede memory card para dto? micro SD din po ang pwede gamitin d2 s D11. Check nyo lng po ung pagkakalagay nyo. Ahm, an0 po battery life nito habang continue ang papaplay ng music throug headsets?